County champions Warwickshire meet T20 winners Hampshire in the CB40 final on Saturday at Lord's as both sides chase their second trophy of the season. Warwickshire will have England's Ian Bell available and will be hoping to replicate the form that won them the County Championship Division One title. 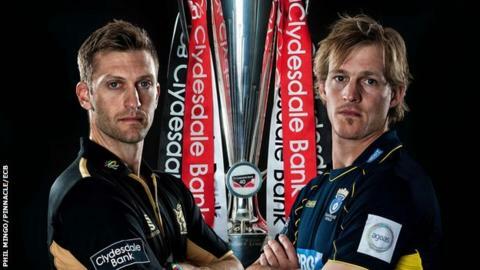 Hampshire beat Yorkshire in the FL t20 final in Cardiff last month to triumph in cricket's shortest format. But which side will be celebrating at Lord's on Saturday evening? The final starts at 11:30 BST on Saturday and BBC Sport reviews the chances of both teams. BBC Radio Solent's Kevan James: "Hampshire feel they are one of the best one-day county sides of recent times and their record seems to back up their claims. "2009 - 50-over winners; 2010 - T20 winners; 2011 - T20 semi-finalists; 2012 - T20 winners, and don't forget a Caribbean T20 final appearance in 2010/11. "A victory at Lord's to complete a one-day double in 2012 would add further credence to their claims. "Michael Carberry and James Vince, with over 500 runs each in the competition at the top of the order, have often seen off sides before they can react (the match against Sussex in the semi-finals was a particularly good example of that). "It's a shame Danny Briggs, Hampshire's top wicket-taker with 19, cannot play because of England commitments, but all-rounder Sean Ervine will contest his seventh final in a Hampshire shirt, a club record. "To end on a further positive, batsman Neil McKenzie, so often the rock in the middle order, has returned from South Africa after two weeks, for this one appearance." BBC WM's Mike Taylor: "Lots of things feel right about Warwickshire's attempt to complete a Championship-CB40 double and they have gathered momentum in this competition at the same time as closing out the four-day title. "Neil Carter, lightly used in his benefit summer, returned to take four wickets in the last group game against Yorkshire and claimed four more in the semi-final in Manchester against Lancashire. His farewell could be a glorious one. "Ian Bell is available, as he was in this final two years ago when he scored a match-winning hundred for the Bears with an innings that combined elegance and power. No one should doubt the England star's desire to perform for his county. "The batsmen and bowlers are in form and the squad has spirit and confidence. They are resilient, experienced and well-led. Warwickshire are a formidable county side these days."